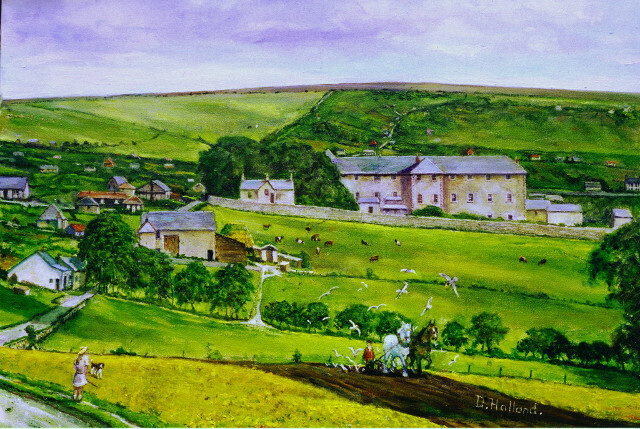 Painting by Douglas Holland from a photograph of early Woodingdean taken early 1920’s from the Racehill, Brighton. Back in July I volunteered to speak at a commemorative event in Woodingdean for the start of World War One. It was too good an opportunity to miss. I knew that the first building plots on the farmland which were to become the southern half of modern Woodingdean were sold in 1913. The second area of building plots in Woodingdean, adjacent to the Brighton Racehill, were sold in 1919. This meant that the origins of Woodingdean started one year either side of WW1. Coincidence? Lots of reading about Victorian and Edwardian Anglo-German relations and British agriculture of this period proved me right. I like being right! Back in Victorian times we had an Empire at a time when our close cousins, the Germans, had just become a newly emerged nation. They were poor and we were rich. And they were understandably jealous. We were rich, not only because of cheap imports of food and raw materials from our Empire. Also, our factories made huge quantities of cheap products for export. British farming became a marginal activity. Our population increasingly left the fields to work in our towns and cities. Farms lost money, and much land went out of production. So shortly before the start of the Great War a land tax was proposed. The government needed the money to defend our increasingly threatened Empire upon which our country had grown to depend. This was a bitter blow to our already impoverished farmers. So they started selling their land to housing developers, who saw a profit in selling such cheap land to those desperate to escape our overcrowded slums. And so Woodingdean was born. Created by the same driving force that just about inevitably led to the World War. The other strand of my research was to look at the local story of Edwardian Brighton, and the farmland that was to become Woodingdean. I found books and documents which provided strong evidence for a story of small market gardeners selling baskets of fresh produce to the hungry population of Brighton. This coincided with a new electric tram extending all the way to the top of Elm Grove by the Brighton Race Course which would have made transport of their goods so much easier. At the time of WW1 central Brighton had the densest housing in Britain outside of London’s east end. More babies died at home then soldiers in the trenches. Disease in Brighton slums was rife. One of the early pioneers in Woodingdean was also the most ambitious. Oscar Selbach was both an engineer and an entrepreneur. He believed that because of its situation on the south facing slopes of the highest hill near Brighton (Newmarket Hill), directly overlooking the sea, it was the healthiest place in Britain. He bought the farmland to the north and east of the crossroads which now form the centre of modern Woodingdean. The south facing slopes were for housing, but the rest of the land was for farming. Industrial production in Britain during WW1 was heavily geared to the production of barbed wire and explosives. Cheap barbed wire after the war could be used for fencing, which meant less labour costs for shepherds and the like. Explosives are largely nitrate based which is the main component of artificial fertilizer. Industry, after coming to our towns, had now arrived on some of the most unspoilt downland in Britain. Len Tuppen, a shepherd who worked for Oscar Selbach on his remote downland farm of Balsdean later told his son that he didn’t stay there long. He didn’t like towns.